← Happy 2015 – And Predictions! The following is a guest-post by Patryk I. Labuda on the potential of pursuing international criminal justice in South Sudan. Patryk is a Ph.D. Candidate at the Graduate Institute of International and Development Studies in Geneva who has worked in South Sudan, Sudan and the Democratic Republic of Congo. In July 2011, after decades of armed struggle against the regime in Khartoum, South Sudan became the newest member of the community of nations. Led by President Salva Kiir, the South Sudanese government embarked on an ambitious program of state building, including economic development, security sector reform and the drafting of a new constitution. But just two years later, discussions about democracy and reform in South Sudan were overtaken by a more pressing concern: war. In December 2013, an old personal rivalry between Kiir and his deputy, Riek Machar escalated into a bloody internecine struggle for power. Reliable data is hard to come by, but estimates suggest that ‘tens of thousands’ have died and nearly 2 million people have been displaced since the beginning of the conflict. As the UN experiences unprecedented difficulties protecting civilians, credible reports indicate that both the government and rebel forces have committed ‘extraordinary acts of cruelty’, amounting to war crimes and, potentially, crimes against humanity. Focusing on the issue of international crimes, this post considers several options for justice and accountability in South Sudan. Last month, on the first anniversary of the outbreak of hostilities, two prominent international groups released assessments of the human rights situation in South Sudan. ‘We Fear the Worst’, a report by the Federation International de Droits de l’Homme (FIDH) was followed by Human Rights Watch’s (HRW) call for ‘Ending the Era of Injustice.’ The two reports reach broadly similar conclusions. Citing the inadequate independence of prosecutors, a climate of intimidation against judges and lawyers, and inadequate legislation and fair trial procedures, HRW endorses the idea of a ‘hybrid judicial mechanism to try serious crimes’, which would operate outside the South Sudanese domestic legal system. FIDH supports the ‘establishment of a special courts system’ to try perpetrators of international crimes, but it recommends that trials take place within the South Sudanese judiciary as a way of building domestic capacity. While there are some differences in methodology, including HRW’s repeated suggestion (p. 1-2) that ethnicity is the driving force behind the conflict and FIDH’s broader development-based outlook (p. 24-30), both organisations appear to agree that purely domestic trials are not viable. Relying on interviews with South Sudanese victims and members of the judicial community, the reports make a strong case that amnesty for past violations will only breed further violence, and that criminal accountability is needed to break the cycle of impunity and establish the rule of law. Given the two reports’ focus on international criminal justice, the elephant in the room appears to be the International Criminal Court (ICC). South Sudanese civil society groups have called for the ICC’s intervention in the past, but the government’s conflicting policies reflect the high political stakes of resorting to the Court. Although some human rights and humanitarian treaties were adopted after independence, South Sudan has not moved to ratify the ICC Statute. President Kiir is on record saying that he would “never accept” the ICC, though on at least one occasion he has reportedly welcomed the Court’s investigations in South Sudan. Kiir’s inconsistent statements can probably be put down to rhetorical bravado and diplomatic gamesmanship, but the South Sudanese government’s position is best explained by old-fashioned realpolitik. Despite breaking away from Sudan in 2011, its northern neighbour remains a key geostrategic partner. Few in Juba will say it openly, but the ICC’s unenforced arrest warrant against Sudanese President Omar Al-Bashir hinders the prospect of ratifying the ICC Statute. As a non-State Party, the South Sudanese government does not have a legal obligation to arrest and transfer Al-Bashir to the ICC. Whatever Kiir’s personal views about Head-of-State immunities, he knows he cannot jeopardise economic and security relations with his northern neighbour during a civil war. Any discussion of the ICC and South Sudan must also be viewed in the wider context of the standoff between the African Union (AU) and the Court. Wary of ‘foreign intervention’ and ‘neo-colonialist ventures’, the AU has championed ‘African solutions to African problems’. Established in March 2014 to ‘investigate human rights abuses’ and propose ways to ensure ‘reconciliation, healing and accountability’, the Commission of Inquiry on South Sudan marks the first time the AU has created such a body. Heralded as a ‘ground-breaking development and a policy watershed’ by Adama Dieng, the UN Special Adviser on the Prevention of Genocide, the Commission was initially given a three-month mandate to complete its work. But nine months later, it has still not published its findings. Just as the violence in South Africa in the early 1990s was a symptom of deep divisions, the same is true of extreme violence in today’s Kenya, Congo, Sudan and South Sudan. Nuremberg-style trials cannot heal these divisions. The contrast between Mamdani and organisations like Human Rights Watch could not be starker. HRW argues in its report that transitional justice efforts, such as truth-telling and economic development, “may have a role to play… [but] such efforts are not an alternative to or a substitute for fair, credible trials.” (p. 13). It then suggests that a Security Council referral of South Sudan to the ICC could be an option if other accountability initiatives fail. While there has been some talk of a Security Council referral as part of a wider policy of sanctions against South Sudan, most local civil society groups have supported a broader set of proposals, including a truth commission, a reconciliation and healing commission, as well as a role for traditional elders. In the end, whether the AU Commission of Inquiry prioritises criminal trials or a broader transitional justice strategy, the contentious debate about the merits of each approach will surely continue as mediators grapple with the difficult question of amnesty. Lost somewhat in the commotion surrounding the ICC and the fight against impunity is the civil war’s broader impact on state-building and political reform. As the conflict drags on, the risk of creeping militarisation and a slide into authoritarianism increases. The National Legislative Assembly, the lower chamber of Parliament, recently passed the National Security Services Act, a piece of legislation granting the security services sweeping authority to keep public order. Amid concerns about its unconstitutionality, the political opposition and international observers warned that the Act could turn South Sudan into a ‘police state.’ Meanwhile, the constitution-drafting process and next year’s national elections are hostage to the endless peace negotiations in Addis Ababa. As various transitional justice and criminal accountability initiatives are analysed and debated in the months to come, it will be important to also remember the centrality of the rule of law and democracy to South Sudan’s future. This entry was posted in ICC Prosecutor, International Criminal Court (ICC), International Criminal Justice, South Sudan, Sudan and tagged Riek Machar, Salva Kiir. Bookmark the permalink. 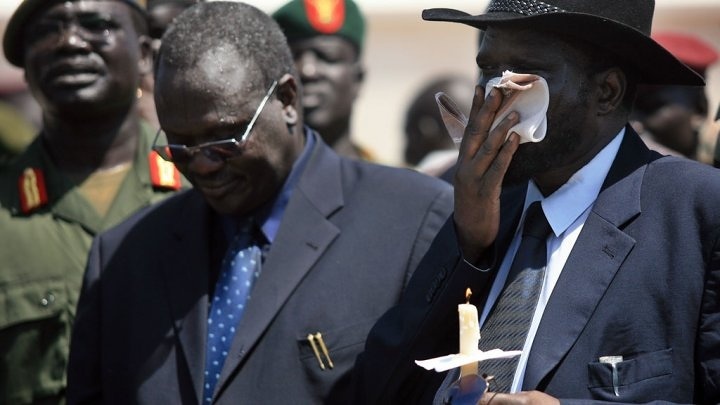 4 Responses to Is International Criminal Justice Coming to South Sudan? I think that it is really hard to exactly establish in which proportions transitional and criminal justice can contribute to a peaceful regime-change and future protection of human rights, I believe that with this regard there is no exact formula which can be set once for all and a lot depends on the context, in particular on the attitude of the parties involved.